In this part, we will create a service that is callable via REST API for that we will need to register a new OSGI service implementing the RegisterProvider interface. This interface defines a getRegistry() method and we will return the IP address as it is a key information for calling REST API defined on a server. A new OSGI-INF file is created, the MANIFEST.MF is updated and a java class is created. You will the java implementation in the PDK sample under the iwd-pdk-workspace/plugin.com.ibm.sample.sharedservice.service/src/com/ibm/service/internal/SampleRegistryProvider.java. The only change you have to do is replace the ‘SharedService-Management’ by the actual name of our service ‘SharedService-PoolManager’. – Get the number of resources in the pool. – Return true if a given threshold resource is reached. – Pick a resource from the pool. – Return a resource to the pool. This is done by creating a file describing the different REST calls. We will put this file as a part of a node-parts. So, using the PDK plugin ‘New’->’Plug-in Node Part’, enter ‘servicePoolManagerAPI’ as name, the nodeparts/servicePoolManagerAPI directory is created and along with the setup.py. Now, we have to load this file at a given place on the server, this can be done by creating a script in the nodepars/servicePoolManagerAPI/common/install. 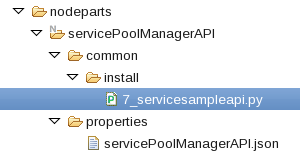 The nodepart must be added in the package for the PoolManager role, so we will modify the config.json accordingly. As you see above, each API will call the restapi.py and as the role is ‘SharedService-PoolManager.PoolManager’, the restapi.py must be created in the PoolManager role. The correct call will be done based on the method, resource and parameter of the request. 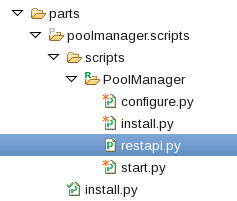 The restapi.py file will be created in the PoolManager role scripts next to the configure.py. return_msg = "No valid method executed"
PS: You can see that I don’t manage concurrency call, if 2 requests comes concurrently, the value of the poolSize will be uncertain. BTW: the maestro.node[‘scriptdir’] is maybe not the best place to save data but it is just for the demo.